The University of Birmingham Institute of Archaeology and Antiquity is an internationally acclaimed research community that brings archaeology and heritage to life. Our research and projects are exciting and diverse, and most recently have involved digging up Shakespeare! 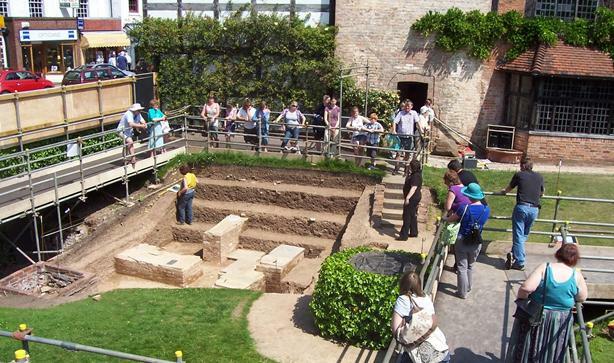 A team of archaeologists from Birmingham Archaeology are involved in the ground-breaking investigation into Shakespeare’s later life where they’ve been excavating the remains of Shakespeare’s last home in Stratford-upon-Avon. The Dig for Shakespeare| began in March when the Shakespeare Birthplace Trust commissioned the University of Birmingham to help it unravel the mysteries of Shakespeare’s last years at New Place. Along with a hardy crew of volunteers our archaeologists have excavated three locations in a dig where visitors can interact with the archaeological team. A special scaffolding walkway and viewing platform has been installed so that visitors can have a close view of the trenches and are invited to talk to the archaeologists as they work. The project, which finishes at the end of October, has already unearthed finds spanning more than 2000 years, including evidence which challenges the historic interpretation of how Shakespeare’s house would have looked, and how the property was used.